I needed some more buildings to fill in a vacant area inside the wye at Mintwood on my former Utopia Northern model railroad. 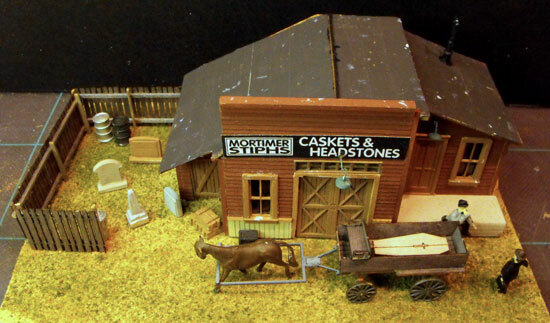 I decided to try one of the whimsical Bar Mills kits because I needed a business that makes and carves headstones for the Woodland Scenics cemetery I built. The building has found a home on my new UNRR at Summit. This was my first attempt at trying Bar Mills kit building. I was very pleased with the kit's instructions and ideas. The instructions tell you just enough. There's more emphasis on drawings and pictures to help you visualize the kit. This is a departure from the comprehensive instructions I'm used to from building Fine Scale Miniatures and Campbell kits. The building is only 3" X 5". I opted to build it on a piece of masonite 6" X 5". The instructions suggested gatorboard. The gatorboard I have is too thick for my purposes because I didn't want the finished scene to be higher than the adjacent road I had installed. The most important instruction was to have patience and not rush the job. This is a craftsman kit, but I think even a beginner could tackle it. I have collected various weights and clamps over the years. They come in handy for keeping things flat while walls dry or vertical while glue sets. I couldn't find any Aleene's Tacky Glue as mentioned in the instructions. I built the kit using carpenter's yellow glue. This glue sets reasonably fast but one has to be prepared to walk away from the project and give the parts time to set up. 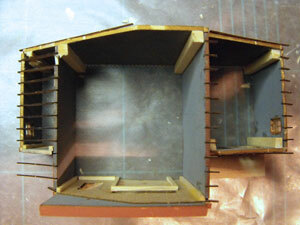 I sprayed the wooden parts while still attached using gray primer in a can. I let the paint dry overnight and then used cheap acrylic craft paints and some Polly Scale colours. It's important to spray prime both sides and use weights to keep wood parts from warping. The thin veneer that is used in the laser cutting process seems more forgiving than typical stripwood. The kit instructions suggest waiting until the structure is completed before installing windows. I prefer to install windows and doors while the walls are still flat. I usually use Goo to afix plastic windows into the wooden walls. Goo can be thinned with acetone (on top of a shot glass works) or used full strength. I use it directly from the tube and apply it carefully with a toothpick or pin. Bar Mills had included little notches in the laser cut walls to help in aligning the walls vertically. It stills takes some fiddling. I can see where a tacky glue would be helpful. 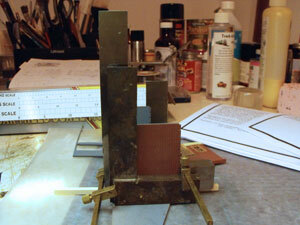 I used various machinists' squares, weights and clothespins to hold pieces while the glue dried. I also put in a lot of heavy bracing. The kit supplies plenty for the job and the rest comes from my ever growing scrap box. As a long time model railroader I seldom throw anything out! The instructions also advised using a metal tray with magnets to keep everything tickety-boo. I bought one a few years ago from Micro Mark. It's a great help when building kits. One of the features I particularly liked about the Bar Mills kit is the handling of the rafters and rafter tails. I've always found this a difficult task in the past when it was necessary to cut all the rafter tails and line them up on lines under the roof eaves. Bar Mills puts little notches in the top of the walls. The rafters and tails fit perfectly. This is an advantage of kits made with laser cut wood. 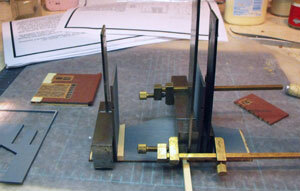 Campbell Scale Models and other older kits never had the luxury of such accurate cutting. The other tedious job that is much easier with a Bar Mills kit is that the roofing paper and some parts such as window mullions are "peel and stick". The tarpaper for the roof even has preprinted indented nail holes. The beauty of a kit like this is you can add a lot of scenic details if you want to take the time. 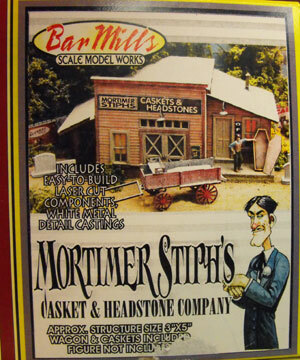 Mortimer Stiph's (I love the name) builds up into a wonderful little vignette. I took the time to let the pigeons attack the roof and added a few people to the scene. There are no figures included in the kit. The wagon parts are included. Making the wagon is acknowledged by the manufacturer as the most difficult part of the kit. It's finicky work like building a Jordan vehicle. However, it looks great when finished. I found a horse in my scrap box. There isn't one in the kit. Here's a front view of the building and a top view so you can see the other parts of the scene I made. Once "planted" in the scenery I will add some trees and bushes around the edges. Go from "bar-mills" to kit building overview. Go from "bar-mills" to Blair Line kit building tips. Go from "bar-mills" to cardstock and paper sructures. Go from "bar-mills" to Clever Models paper buildings. Go from "bar-mills" to Scratchbuilding for beginners. 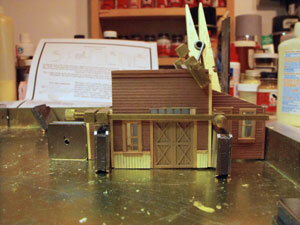 Go from "bar-mills"" to Campbell Scale Models freight house. Go from "bar-mills" to How to build a rail barge (carfloat). 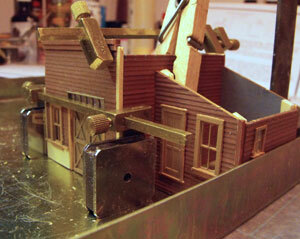 Go from "bar-mills" to How to build a moveable barge . Return from "bar-mills" to my Home Page.